How Do I Set Up An ACH Payment? An ACH payment is an automatic withdrawal from an account with existing funds instead of a line of credit. In addition, this form of payment is initiated by the party who charges for services, not the account holder. AvantGuard processes ACH payments on the 20th of each month for the entire balance due. If you would like to request a different amount be charged, you must contact the billing department. When set up for automatic withdrawal, ACH payments can be charged for the last 30 days of service. They can also be used to make a one time payment for your chosen amount. A reason many companies choose to pay using ACH, is there are no additional processing charges associated with ACH payments. In order to set up an ACH payment, you must first identify your bank account and routing numbers. 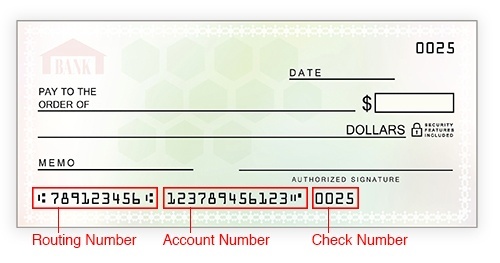 To do this, first identify the numbers at the bottom of a check, or simply perform an online search of the routing number for your financial institution. If you do not have checks to reference for your account number, you may have to contact a financial representative at your bank to get it. 3. Once you have identified the two numbers, communicate them to the billing department by email: billing@agmonitoring.com.